Costa Rica’s volcanoes are part of the Pacific Ring Fire Circle and include more than 200 volcanic formations, some of which are more than 65 million years old. The majority of Costa Rica’s most visited volcanoes are caldera volcanoes, which have large, water-filled craters, fumaroles and rising steam. Today, about 100 of those once-molten mountains show minor volcanic activity but only six of Costa Rica’s volcanoes are considered active: Arenal, Irazú, Poás, Rincón de La Vieja, Miravalles, and Turrialba. 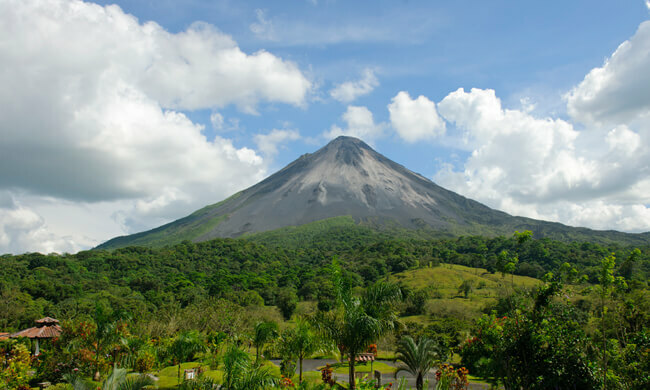 Arenal is the country’s most famous volcano, once known for daily eruptions and lava flow; in 2010 it entered a period of inactivity. Located in the province of Alajuela, Poas Volcano is one of Costa Rica’s most popular active volcanoes to visit. Because it is only about an hour-and-a-half from San Jose, visiting the volcano and national park make for a great day trip.